First it was burgers. Every self-respecting chef in town wanted their own gourmet versions. Now it's pizzas -- all over again. Didn't Wolfgang Puck make them chic and overpriced back in the day? Well, they're back, and the expression, "they're eating it up" has never been more fitting. 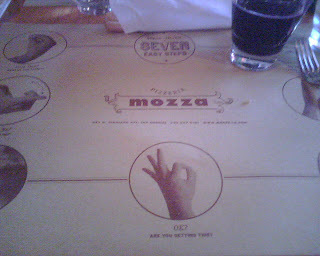 The day I went to sample the much-anticipated and hyped pizzas at Mozza, Frank Bruni at the New York Times had reviewed it -- and a pretty glowing review, at that. My dinner companion had booked a table one month in advance and managed to land one at the early bird hour of 5:15pm on a weekday, and every table was abuzz about the review. The short end of it is that I would return but given the prices, not that often. And I liked the pizza in Bologna and Grimaldi's in DUMBO (Down Under the Manhattan Bridge Overpass -- Brooklyn) better. 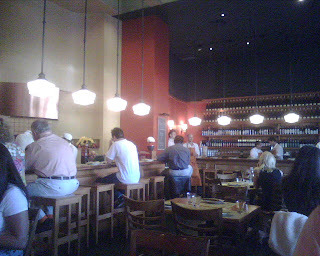 Walking in, I liked the cozy atmosphere with the high ceilings that almost had a New York vibe. Another reminder of New York, perhaps not that welcome, was the close seating. We sat elbow-to-elbow with our neighbors, admiring their babies, sharing travel stories, discussing the review and most importantly, stealing glances at the type of pizzas they had ordered and exchanging thoughts about our favorites. Initial service was routine and not so attentive, but our designated waitress was great. She was very nice and made some good recommendations. Like the red sparkling wine, for instance. We were initially apprehensive about getting sparkling red wine, but it was a hot day and we decided to try something new. I think it was called Lambrusco from the Emilia-Romagna region in Italy. It was very refreshing and a nice way to kick off the meal. For appetizer, our adventurous inkling had us order Speck, which we never had before. It's smoked prosciutto and tasted very, well, smoky. After tearing the speck into edible sizes and popping them into our mouths solo, our waitress suggested we try wrapping the speck around the breadsticks served on the house. That waitress -- she knew her stuff! The breadstick married perfectly with the speck's smokiness. Then came the difficult decision of selecting the pizzas. I counted 16 varieties, from the famed fennel sausage one to the egg and asparagus one. After much pondering, we ordered the mixed mushroom (funghi misti) that came with fontina and taleggio (defined by wikipedia as "one of the oldest soft cheeses"), as well as thyme. The second one was my choice, and my obsession with squash blossoms (They're so beautiful and I want to buy them at the farmers' market stand but I'm at a loss when it comes to cooking with them. 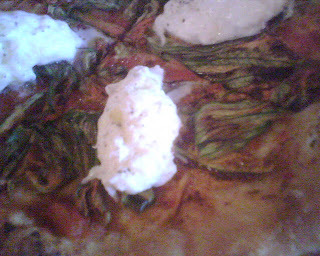 Don't think I like the stuffed preparation and trying to not have too many fried food) led me to the squash blossoms, burrata (buffalo mozzarella) and tomato pizza. 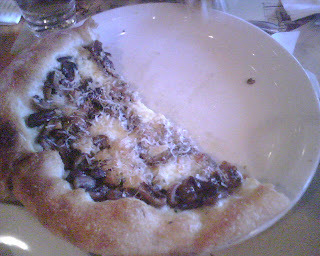 The verdict: The mushroom pizza was salty and a bit greasy. 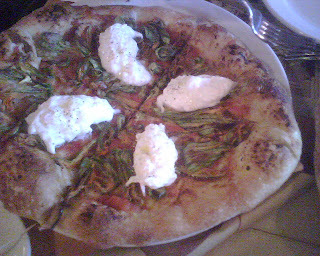 The squash blossoms pizza, on the other hand, was much more flavorful, and I liked how the mozzarella (the restaurant's namesake) was raw and not melted and stringy like in cheap pizzas. The squash blossoms gave the pizza a lovely orange and green color, and their texture and subtle flavor were a pleasant surprise. Definitely not your average pizza. The pie crust was thin and crispy, but like Bruni of the Times, I thought the crust edges were too hefty. I liked that the pizza was light, although not as light as Grimaldi's. It's true that I had my reservations about this place because of the hailing of Nancy Silverton as the goddess of crust and pizza. Throw in a mega-celebrity chef like Mario Batali and you've definitely got hype and inflated expectations. I like Campanile ok and La Brea bakery is decent, but the bread there is not as good as in Balthazar in New York City or Acme Bread Company in San Francisco. Nevertheless, I look forward to Osteria Mozza, which will open next door shortly, we hear. To square off the meal, we got something with an Italian name that resembled a parfait with sliced strawberries, strawberry gelato, whipped cream, macaroons and toasted almonds (if I recall correctly). It's hard to go wrong with gelato, although I have had some disastrous gelato experiences. It wasn't too sweet and except for the occasional French style macaroons floating in there, I enjoyed every bite. I'm not a fan of macaroons, that's all. Sidenote: I found it a tad pretentious and puzzling that some of the items on the menu were in Italian and others in English. Why call tomato a tomato and arugula rucola? Why not call it pomodoro? Some practical tips: Park on Highland on the southeastern side of the restaurant, as there is 2-hour street parking until 6pm and valet is $7.50. Don't park on the southwestern side of Highland, as it is permit parking only. 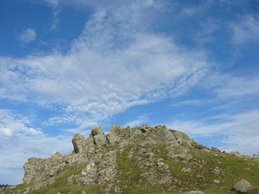 If you don't feel like planning a whole month in advance, I hear it doesn't get as crowded during off-hours, like around 3-4pm on a weekend or I would imagine much less on weekdays. Maybe the Times' review will make that impossible for some time. Your blog makes me want to move to LA! your visit this summer will be a primer to the real move! i can't wait to go on an eating tour w/you. there won't be enough time to do it all but hopefully you'll be back. see you soon!